Over the years, the adoption of cloud computing in healthcare has increased owing to the rising need to curtail healthcare costs and improve the quality of healthcare. Thus, the stakeholders in the healthcare cloud computing market have implemented Clinical Information System (CIS) such as Electronic Medical Record (EMR), Computerized Physician Order Entry (CPOE), and Radiology Information System (RIS), among others. This technology offers easier and faster access to data depending on the way it is stored, that is, on public, private, or hybrid cloud. In 2014, the Clinical Information Systems (CIS) segment accounted for the largest share of the North American Healthcare Cloud Computing market, by application; the private cloud segment accounted for the largest share of the healthcare and life sciences cloud computing market, by deployment model; the Software-as-a-service (SaaS) segment accounted for the largest share of healthcare and life sciences cloud computing market, by service model; the pay-as-you-go segment accounted for the largest share of the healthcare and life sciences cloud computing market, by pricing model; the software segment accounted for the largest share of the healthcare and life sciences cloud computing market, by component; while the healthcare providers segment accounted for the largest share of the healthcare and life sciences cloud computing market, by end user. In 2014, the U.S. accounted for the largest share of the North American Healthcare Cloud Computing market and is expected to witness the highest growth rate. The market for healthcare cloud computing in the U.S. is expected to rise in insurance enrollments triggered by the Patient Protection and Affordable Care Act (March 2010), inadequate IT infrastructure among payers, and conference, symposia, and seminars conducted on cloud computing in the U.S. The North American Healthcare and Life Sciences Cloud Computing market witnesses high competitive intensity as there are several big and many small firms with similar product offerings. These companies adopt various strategies (agreements, partnerships, collaborations, expansions, and new product launches) to increase their market shares and to establish a strong foothold in the North American Healthcare Cloud Computing market. Cloud computing helps store, manage, and process data from disparate locations, and delivers hosted services over the internet. In the healthcare industry, cloud computing as a technology is offered in four forms, namely, computation, storage, memory, and networking. Cloud computing is increasingly being adopted in the healthcare industry owing to the increasing pressure to curtail healthcare costs, while maintaining the quality of care provided to patients. 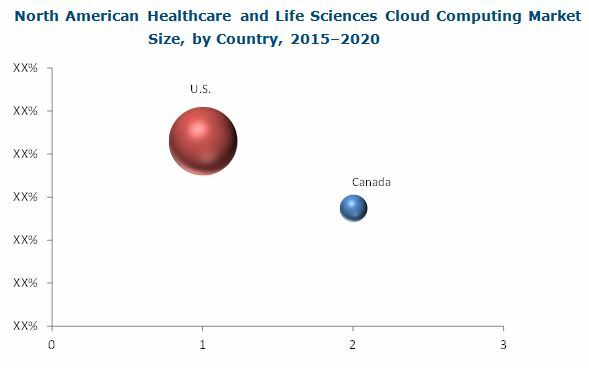 The North American healthcare and life sciences cloud computing market is segmented on the basis of application, deployment model, service model, pricing model, component, end-user, and region. By application, the healthcare and life sciences cloud computing market is categorized into Clinical Information System (CIS), Non-clinical Information System (NCIS), and life sciences applications. In 2015, the Clinical Information System (CIS) segment is expected to be the largest share of the healthcare and life sciences cloud computing market. This segment is expected to grow at the fastest rate during the forecast period (2015 to 2020). On the basis of deployment model, the healthcare and life sciences cloud computing market is categorized into public cloud, private cloud, and hybrid cloud. In 2015, the private cloud segment is estimated to account for the largest share of the North American Healthcare and Life Sciences Cloud Computing market. The North American Healthcare and Life Sciences Cloud Computing market, by service model, is segmented into software-as-a-service (SaaS), platform-as-a-service (PaaS), and information-as-a-service (IaaS). In 2015, the software-as-a-service segment is expected to account for the largest share of the North American Healthcare Cloud Computing market. The healthcare and life sciences cloud computing market, by pricing model, is segmented into pay-as-you-go and spot pricing. In 2015, the pay-as-you-go segment is expected to account for the largest share of the North American Healthcare Cloud Computing market. On the basis of component, the healthcare and life sciences cloud computing market is divided into hardware, software, and services. In 2015, the software segment is estimated to account for the largest share of the North American Healthcare and Life Sciences Cloud Computing. On the basis of end user, the healthcare and life sciences cloud computing market is divided into healthcare providers, healthcare payers, and life sciences companies. In 2015, the healthcare provider segment is estimated to account for the largest share of the North American Healthcare Cloud Computing market. The key factors that are expected to spur the growth of North American Healthcare Cloud Computing market are reforms of various countries benefiting healthcare IT, proliferation of new payment models and cost-efficiency of cloud technology, and implementation of the Patient Protection and Affordable Care Act (PPACA). Moreover, teleCloud and formation of Accountable Care Organizations (ACOs) are to create opportunities for healthcare cloud computing market. However, security of patient data on cloud is a crucial task and is likely to restrain the growth of this North American Healthcare and Life Sciences Cloud Computing market. The North American healthcare and life sciences cloud computing market is expected to reach USD 11.43 Billion in 2020 from USD 4.49 Billion in 2015, growing at a CAGR of 20.5%. The market is expected to be dominated by the U.S. Some of the major players in the North American Healthcare Cloud Computing market include athenahealth, Inc. (U.S.), CareCloud Corporation (U.S.), ClearData Networks, Inc. (U.S.), Carestream Health (U.S.), Dell Inc. (U.S.), GNAX Health (U.S.), IBM Corporation (U.S.), Iron Mountain, Inc. (U.S.), Oracle Corporation (U.S.) and VMware, Inc. (U.S.). Table 6 Leading Solutions From Athenahealth, Inc.
Table 7 Leading Solutions From Carestream Health, Inc.
Table 8 Leading Solutions From Merge Healthcare, Inc.